Ensemble Theatre presents, THE PLANT, by Kit Brookman, at the Ensemble Theatre, Kirribilli, 8th July - 5 August. THE PLANT, by Kit Brookman, is the winner of the Ensemble Theatre's 2016 New Writing Commission. Sue (Sandy Gore) and her three children, Erin (Helen Dallimore), Daniel (Garth Holcombe) and Naomi (Briallen Clarke) are packing up the family home after the death of the Husband/Father from, what one of them describe as: 'in-built obsolescence'. It is essentially a comedy. On a raised green covered platform, backed by a wall of curtain (the Set and Costume Design is by Isabel Hudson, working within the skeleton of the NEVILLE'S ISLAND Set demands, the other play in repertoire at the theatre), the Director, Elsie Egerton-Till, moves the actors around the space to use shared direct novelistic exposition to the audience whilst also accommodating interactive scenes between the characters. The children, all, are pre-occupied with their own lives and only cursorily attend to their mother's needs. It is three years since the passing and Sue has not recovered from her loss. She responds by buying a plant, a Bergonia Rex, and gives it a name, Clare, and has animated conversations with it. The children are kinda weirded-out. Mother seems more contented. It is a comedy with a very gentle observational eye on the millennial manners of this time. But, soon, we are introduced to the plant with a human form (Michelle Davidson, swathed in a 'plant costume'), and suddenly, the play lifted into an intriguing surreal possibility - the possibility of an absurdist reality, A Lewis Carroll, Eugene Ionesco or even Monty Python wonderland!! I was immediately excited to see where Mr Brookman was going to go. Unfortunately, we are quickly disabused of that tantalising trajectory and we are shown a meeting at the ocean edge between depressed Sue and a homeless young woman who strike a deal for mutual support and aid. So, the play returns to a pat-naturalistic set of conflicts that are amusing but oh-so-familiar, even when faintly ridiculous. The playwright, tiresomely, over-explains all the motivations, and the action of the play stays fairly static and so we, mostly, get to admire the charm and skill of the actors to keep us continuously, pleasantly, engaged. Ms Dallimore and Clarke are especially spry with their material and carry great conviction both comic and real. Mr Holcombe manages a fairly cliche arc-journey and character with aplomb, whilst Ms Davidson puts to very admirable result her personal charm and skills to keep us interested in the not completely realised - in the writing - potential of her human/plant, Clare. 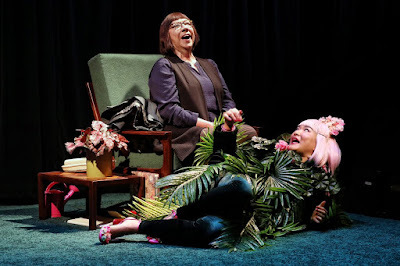 At the centre of the play is Ms Gore who holds a delicate balance with her character's depression and comic struggle to survive, using a mellifluous vocal sound that, for some, is mannerist and an irritant, for others, a delight. Ms Egerton-Till's management of the stage is not always sure in the demands of the space and its relationship with its audience, but that maybe the result of the need to share the Design area. The Lighting, by Benjamin Brockman is not as subtle as to make it invisible, as yet, whilst the Sound Design, by Daryl Wallis supports the world and atmosphere of the work. THE PLANT, is a pleasant time spent in the theatre and is a benign and amused observation of possible modern manners.